WITHOUT PLACING THEM ON THE GRILL SURFACE TO PREVENT STICKING AND FLARE UPS. 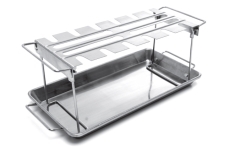 INCLUDES STAINLESS STEEL PAN AND WING RACK THAT FOLDS FOR CONVENIENT STORAGE. Wings were great ? Impossible to get rack cleaned. I guess you use it a few times and throw it away and get a new one. Bernie, that's a bummer. 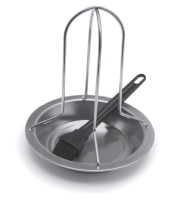 We know how annoying it is to have difficult-to-clean grill cookware. But for a $28 stainless steel part, no you should definitely not have to buy a new one after a few uses. Some suggestions are to soak it in soapy water overnight, try rinsing it off and putting in your dishwasher, or if you have one, blast it with a pressure washer. You can also put the pieces in the grill and turn it on high to burn off all the sugar and fat from the wings. It won't look pretty, but it will work and won't get funky. Thanks for your comment!